I organized a dinner and night out for my friends who are getting married soon. The night turned out very nice and hubby was the one that prepared all the foods. Here's the menu we had. 1. 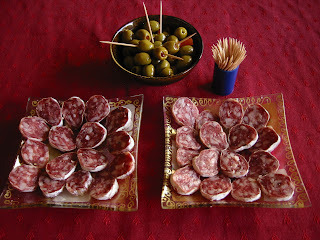 Appetizers: French sausages, olives, guacamole. 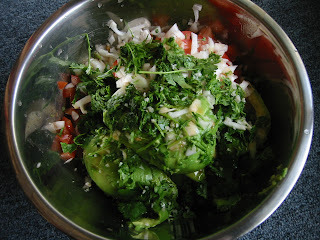 You can find the recipe of this Guacamole here. 3. Bio salad. We didn't serve cheese. After that we went out dancing salsa. It was fun. And I'm very happy that I managed to drink without problem since I was the only one not drinking alcohol in the bar hehe. Food looks good. May I ask how do you or hubby prepare guacamole? I like it but never tried it myself. Always bought the frozen version. I love Fajitas by the way. They're yummy. Sounds like you had a lovely night. Oh...Magarita - my favourite cocktail. wah... hubby taking care of everything. but the fruit salad... jus strawberry and banana? I will post the recipe for the guacamole later. No lah there are lots of other fruits under the layer of banana and strawberry hehe. The colors of Banana and Strawberry are nice. Good match. BE, nice, hubby can cook :)-. The fruit salad looks really yummy! Malaysian foods need a lot of work and I was not in mood to cook, eventhough those were my guests. It's cool to have someone else taking care of the cooking part and me just hanging around serving people. 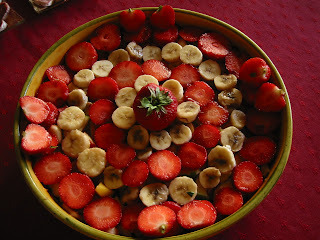 p/s Haven't tried combining bananas and strawberry as fruit salad. How's the taste? What dressing do you use?